There is no better way to show someone you care than with a Therapy Gift Voucher. 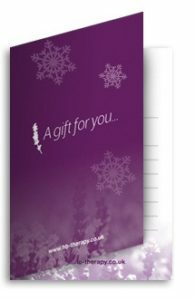 Our Gift Vouchers can be bought as a value of your choice or more personally, as a specific treatment. Our Gift Vouchers come beautifully presented in a gift box with ribbon, (saving you the time of wrapping) so, for a special gift- no matter how big or small choose Therapy Gift Voucher. Gift Vouchers can be purchased over the phone and we’ll post it to the chosen address first class Free Postage. Call 02086933773 to order you vouchers. HB Therapy Gift Vouchers are available for any occasion. Whether your looking for a Birthday, Valentine, Christmas, Baby shower or even a leaving gift look no further than a THERAPY GIFT VOUCHER.